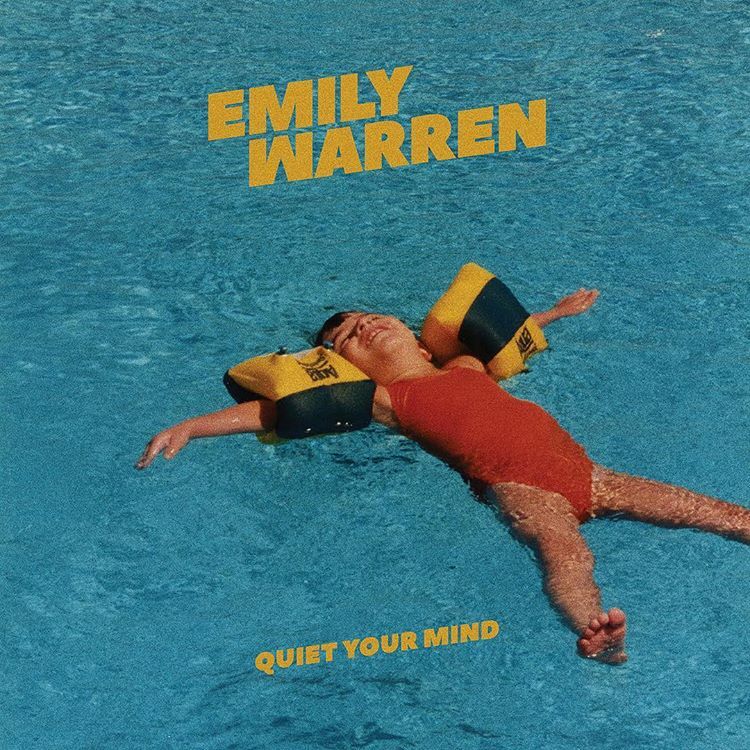 Emily Warren invites us into her world with debut album ‘Quiet Your Mind,’ a combination of feel-good pop and lyrics that comfort. Emily Warren came to prominence through her songwriting credentials, a force behind chart-topping artists including Dua Lipa, Jessie J and Sean Mendez. Her frequent collaborations with The Chainsmokers, writing and singing on tracks such as “Don’t Let Me Down” and “Side Effects” brought a voice and face to her name while subsequent touring with the duo enabled further immersing in the musical environment. Last year, Warren took songwriting and recording into her own hands while releasing a series of solo singles including the piano-driven ballad “Something to Hold on To” and “Poking Holes,” an upbeat reminder to address life’s challenges before they amount to the unattainable. Her debut album, Quiet Your Mind (released 5 October) is an approachable blend of gentle pop, catchiness, and an honest sweetness that evokes listening to a best friend express their inner emotions on a relaxed sunny afternoon. Quiet Your Mind is a way of coming to terms with these matters and doing so in a way that feels very naturally of-the-moment. Listeners are welcomed into Emily Warren’s world, as opposed to the one she co-creates with other artists, and it’s one of personal relationship tales, gathered emotions, and the musical influences ingrained in her songwriting approach. Here she chats with Atwood Magazine about the making of Quiet Your Mind, its lyrics, and the impression she hopes people will get from it. ATWOOD MAGAZINE: HI EMILY, LET'S START WITH YOUR CAREER SO FAR AS A SONGWRITER. I THINK IT'S INTERESTING BECAUSE THE PROFESSION CAN FEEL A LITTLE BIT MYSTERIOUS, LIKE SOMETIMES IT'S JUST SO EASY TO ASSUME THAT THE NARRATIVE AND EVERYTHING ALL BELONGS TO THE PERSON SINGING. HOW WAS YOUR FIRST SONGWRITING ROLE SECURED? DID YOU KNOW SOMEBODY, DID YOU APPLY, OR WERE YOU APPROACHED? Emily Warren: I actually was sort of pushed into a collaborative writing session when I was in college by someone who was managing me at the time. My first ever session was with Scott Harris and we just totally hit it off. We starting writing a bunch and I decided to give it a real go and put my own artist stuff on the back burner. Once I had a few songs, I started sending them off to anyone whose email I could find and ended up sending them to an A&R named Rhea Pasricha who I had met a couple years earlier when she found my band on myspace. She had just switched over to Prescriptions songs and shortly after she signed me. It was all a whirlwind and pretty surreal but after that I dove head first into the writing and fell in love with it. WHAT DOES THE PROCESS OF WORKING WITH OTHER POP STARS ENTAIL? IS IT VERY COLLABORATIVE, SITTING IN A ROOM AND WRITING WITH THEM, OR DO YOU TEND TO HAVE A CONVERSATION TO GET INTO THEIR MINDSET AND THEN GO AND WRITE INDEPENDENTLY? Emily Warren: It’s actually parts of both. And it differs artist to artist. But more often than not I get in the room, have a long conversation and try and see where they’re at and what’s going on and after everyone is comfortable we start putting those ideas into a song. I definitely love working with artists who want to collaborate though, it makes it a lot easier to write something that’s personal to them and genuine. IN THE LAST INTERVIEW YOU DID WITH ATWOOD MAGAZINE BACK IN JANUARY YOU SPOKE OF YOUR RELATIONSHIP WITH MUSIC GROWING UP: HOW YOU DAD WAS VERY MUSICAL AND HOW ONCE YOU DISCOVERED THE PROFESSION OF SONGWRITING YOU BECAME REALLY FOCUSED ON STRUCTURE, LYRICS, AND MELODY OF THE SONG YOU WERE LISTENING TO. WHAT KIND OF MUSIC WERE YOU LISTENING TO AND CAN YOU GIVE ANY EXAMPLES OF SONGS YOU'VE DISSECTED THAT HAD AN IMPACT ON YOU? Emily Warren: Hell yes. Probably every single John Mayer song. I absolutely love the way he tells a story and I find that his melodies always compliment the lyrics in tone and emotion. He’s one of my biggest influences for sure. Beyond that, I’ve always loved Ella Fitzgerald and The Great American Songbook. Those songs are so sweet and the structure is really interesting. There’s often a twist or a punch line at the very end that you have to listen to the whole song for. I LOVE WHEN MUSIC CAN CATCH YOU LIKE THAT. YOUR SOLO WORK IS OBVIOUSLY VERY REPRESENTATIVE OF YOU AND THE LYRICS COME ACROSS AS REALLY PERSONAL WITH THEIR FOCUS ON RELATIONSHIPS AND HONESTY. HAD YOU BEEN WRITING THESE THINGS DOWN OVER THE YEARS WHILE WORING WITH OTHER ARTISTS OR WAS THERE A MOMENT WHEN YOU WERE LIKE 'OK NOW I'M GOING TO SIT DOWN AND LET OUT ALL THESE PERSONAL THINGS FOR MYSELF'? Emily Warren: There are two songs, “Just Click” and “Not Ready to Dance”, which I actually wrote back before I had really decided to do an artist project. Whenever someone showed interest in them or wanted to cut them, I was super hesitant. That’s when I realized it was time to put my own music out. After that we set some time aside specifically for writing the album. I like to keep writing for myself and others pretty separate. HAVING WRITTEN FOR A LOT OF POPULAR PEOPLE, SUCH AS DUA LIPA, CHARLI XCX, AND YOUR COLLABORATIONS WITH THE CHAINSMOKERS, YOU MUST HAVE AN UNDERSTANDING OF THE MUSICAL INGREDIENTS THAT GO INTO MAKING A SUCCESS. IS THERE ANYTHING YOU'VE CONSCIOUSLY BROUGHT FORWARD INTO THE MAKING OF YOUR ALBUM? Emily Warren: I think inherently the album has pop melodies and structure just because thats how I’m used to writing. That being said, I’ve really tried to abandon the expectations I hold when I’m writing for pop specifically, which has been challenging, but this album is really just creative expression and a real outlet for me. ARE THERE ANY LYRICS ON THE ALBUM THAT ARE EXTRA IMPORTANT TO YOU, MAYBE DUE TO THEIR MEANING OR THE WAY THEY WERE WRITTEN? Emily Warren: The lyrics on “Not Ready to Dance” and “Just Click” are some of my favorite lyrics I’ve ever written. I wrote them both with Scott Harris and I’m really proud of the story telling. If you focus on the lyrics they take you on a whole journey. THROUGHOUT THE ALBUM THERE'S A SENSE OF DEPENDENCE UPON A LOVED ONE. THE LYRICS IN “SOMETHING TO HOLD ON TO,” FOR EXAMPLE, BEING 'SORRY I SQUEEZE TO TIGHT, I REALLY HOPE YOU KNOW/ THE REASON THAT I'M SCARED TO LET YOU GO IS/ I'M GONNA NEED SOMETHING TO HOLD ON TO.' ARE THERE THINGS YOU FEEL THAT CAN BE EXPRESSED THROUGH SONGWRITING THAT CAN'T IN PERSON? PERHAPS BY WRITING IT DOWN OR PUTTING IT INTO MUSIC MAKES IT MORE REAL. Emily Warren: Hell yes. There were a lot of truths that came out in my relationship through the songs. I think when writing you have to be really clear and thoughtful because you only have so many lines and I’m really set on having every line be truthful and honest. So I definitely get myself in a state when I’m writing where I can say things more eloquently than I might be able to when I’m just spitballing. WOULD YOU BE ABLE TO GIVE AN INSIGHT INTO THE MAKING OF THE ALBUM, SUCH AS ITS RECORDING, WHAT THE SESSIONS WERE LIKE, AND ANY DEVELOPMENTS THAT MAY HAVE BEEN MADE IN THE PROCESS? Emily Warren: Yeah, we actually spent a week in Hawaii writing most of these which was really dope. It was a week of swimming in the ocean and making music which is obviously the dream. A lot of the demo vocals that I cut that week ended up making the record but after that, since we all live in different places, there was just a bunch of sending the songs back and forth and tweaking production and getting them right. From then on, it’s just getting all the visuals and everything else together. SIMILARLY, YOU WORK WITH OTHER PEOPLE ON THE ALBUM: SCOTT HARRIS, BRIT BURTON, MAC & PHIL. WHAT INPUT DID THEY HAVE IN THE MAKING OF THE SONGS? Emily Warren: I definitely could not have made this album without them. They’re some of my favorite writers/producers on the planet and beyond that we’re all friends so it’s just an absolute joy making music with them. We’ve experienced a lot together so when it comes to writing my story they kind of know most of what’s been going on with me so it’s a really comfortable and fun process. MANY OF THE SONGS HAVE A VERY EASY-GOING, SUNNY VIBE- “AS LONG AS I'M ALIVE” AND “THE POINT.” OR THERE'S A SILKY SMOOTH (YOUR VOICE!) STRIPPED BACK TENDERNESS- “NOT READY TO DANCE” AND “JUST CLICK.” BECAUSE OF THIS, “LIKE THAT” IS LIKE A BURST OF ATTITUDE, A KIND OF NO-NONSESE GUIDE TO DEALING WITH A PROBLEMATIC GUY. WHEN IT COMES TO EMPOWERING AN INDIVIDUAL, WHAT DO YOU FEEL GOES INTO A SONG TO ACHIEVE THIS? Emily Warren: I know I’m beating a dead horse but I really believe that if I write honestly and make sure what I say genuinely lines up with my morals and beliefs then it can have an empowering message. I think morals get lost when people write from a foreign perspective. That’s largely why it’s important to have, for example, a female writer in the room when writing for female artists etc. FINALLY, WITH THIS BEING YOUR FIRST SOLO RECORD, WHAT DO YOU HOPE PEOPLE TAKE AWAY FROM IT IN REGARDS TO YOU AND YOUR MUSIC? Emily Warren: I fell in love with music because it comforted me when I needed it the most. You know when you hear a song and it sounds like the artist is singing about you? Telling your story? I’ve always believed that that springs from people writing from a really vulnerable place, so that’s what I really tried to do with this record, in hopes of providing some comfort and paying what music has done for me forward to anyone that needs it and connects with it.